A skateboard is one of the more “traditional” methods of a teen, normally, to get around quick and easy – while letting the skateboarder burn a fair number of calories as well. Of course, a high quality skateboard is can cost quite a bit, but how about taking a slightly different route with the £899.99 ZBoard Pro (which is obviously different from the Zboard)? 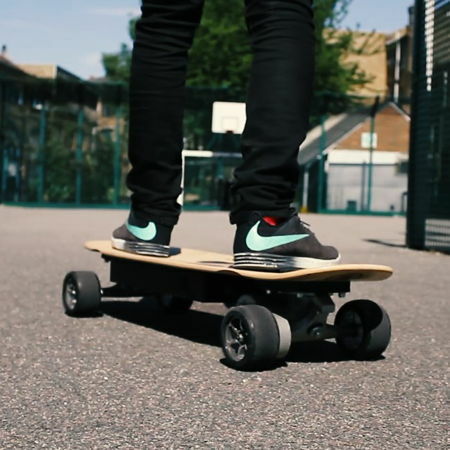 This is no ordinary skateboard, as it is a unique device that would be more accurately be described as a weight-sensing electric board. Needless to say, it is made out of a slab of good wood, making this an one impressive piece of technology. Best of all is, the ZBoard Pro will be able to change speed based on the amount of foot pressure applied to it – basically, all that you need to do is to lean forward in order to go forward, and to lean back to stop. Apart from that, you will be able to achieve speeds of up to 20MPH, which means no one is going to catch up with you each time you speed off into the distance. Controlling the ZBoard Pro does look as though it is extremely intuitive, and the regular urethane wheels are able to let you zip around at speeds of 17MPH. The entire shebang tips the scales at just 25 lbs, where it requires a charge time of just 5-6 hours.